The Acropolis of Midea was founded on a hill 268 m. high that dominates the northeastern recess of the Argive plain. The 4th Ephorate of Prehistoric and Classical Antiquities is organizing an event at the Mycenaean Acropolis of Midea, on Friday, September 6th. Dr Aikaterini Dimakopoulou (Emeritus Ephor of Antiquities and Director of the excavations at Midea), Nikoletta Divari-Valakou (Director of Prehistoric and Classical Antiquities at the Hellenic Ministry of Culture) and Themistocles Bilis (architect) will give presentations about the excavation works and the restoration and enhancement program of this archaeological site of major significance. The first trial excavations at Midea were undertaken in 1939 by the Swedish archaeologist Axel Persson, the excavator of Dendra and Asine. Limited research was carried out in 1936. Systematic excavations on the Acropolis were initiated as a Greek-Swedish programme in 1983, thus recently in comparison with research at Mycenae and Tiryns, which began a century earlier. On the lower northeast terraces of the Acropolis was found a complex of buildings, the most important of which is a large rectangular construction in the form of a “megaron”. The Acropolis was founded on a hill 268 m. high that dominates the northeastern recess of the Argive plain. This strategic position with its unhindered view provides the possibility of controlling the entire plain together with the gulf of Argolis, an advantage that contributed greatly to the flourishing of Midea during Mycenaean times. The Acropolis site, which is surrounded by a Cyclopean fortification wall, is divided into two levels, the Upper and Lower Acropolis. The Lower Acropolis, with a series of sloping terraces, takes in much of the northwestern side of the hill, whereas the Upper Acropolis is confined to its rocky summit. The Upper and Lower Acropolis, the East and the West Gate and the fortification wall. As the excavations have shown, Midea was already inhabited during the final phases of the Neolithic period (5th and 4th millennia BC), and it developed into a flourishing settlement during the Early and Middle Bronze Age (3200-1600 BC). 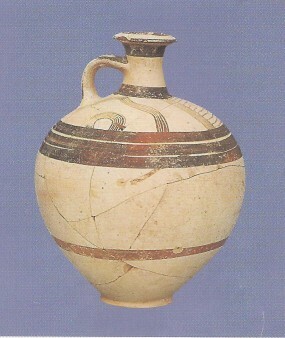 During the Mycenaean period (1600-1100 BC) it was an important centre, reaching its height in the 13th century BC. At the end of the 13th century BC, Midea, as both Mycenae and Tiryns, was hit by a powerful earthquake and fire that caused extensive damage to the Acropolis. The next phase in its history goes back to the Archaic period, probably with the founding of a sanctuary. Midea was inhabited sporadically in Late Roman and Byzantine times as well. A strong fortification wall protected the top of the hill and much of the northwest slope. The southeast remained unfortified since the steep rock in that area provided natural protection. The circuit wall encloses an area of 24,000 sq.m. and it is built of enormous blocks in the Cyclopean system, like the fortifications of Mycenae and Tiryns. The wall is 450 m. long, 5-7 m. in width and at a number of places it is preserved to a height of 7 m. Its construction is dated to around the middle of the 13th century BC. The two monumental Gates of the Acropolis, the East Gate and the West Gate, are located opposite each other at crucial points of the fortification. The East Gate, which was the main entrance and led to the Upper Acropolis, forms a wide opening in the wall. The entrance, which was approached by a built ramp, comprises a monolithic threshold in which is preserved the socket for the doorpost. The West Gate, which led to the Lower Acropolis, was formed between the end of the southwest leg of the fortification wall and the steep rock that borders the Upper Acropolis. Within the thickness of the wall is an inner room that served as a guardhouse and storage space. Gate and room are both protected by an imposing solid tower. Found on a terrace of the Upper Acropolis were important building remains and graves of the Early and Middle Bronze Age (3200-1600 BC) with much pottery, including considerable number of Neolithic sherds. The finds provide evidence that the pre-Mycenaean settlements of Midea were established on the top of the hill. 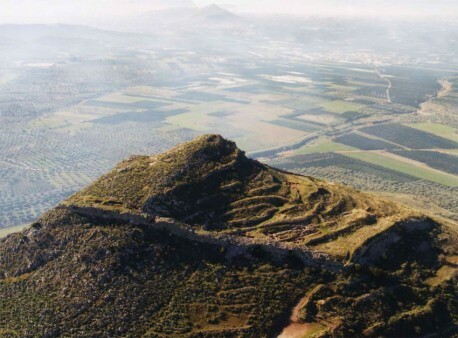 Traces of walls found at the centre of the Upper Acropolis, where the rock had been leveled, were attributed by the first excavator to the Mycenaean palace of Midea. On the lower northeast terraces of the Acropolis was found a complex of buildings, the most important of which is a large rectangular construction in the form of a “megaron”. It was destroyed by the earthquake at the end of the 13th century BC, then was rebuilt in a new form as a long narrow space with a central colonnade reminiscent of the later megaron of Tiryns of the 12th century BC. Excavations on an extensive terrace of the southwest slope of the Lower Acropolis revealed the remains of three buildings that had been used as dwellings and workshops and are datable at the end of the 13th century BC. Their excavation brought to light much pottery, clay figurines, stone and metal vessels, tools, jewellery, sealstones and pieces of semi-precious stones. The most important find is a clay sealing with an inscription in the Linear B script. 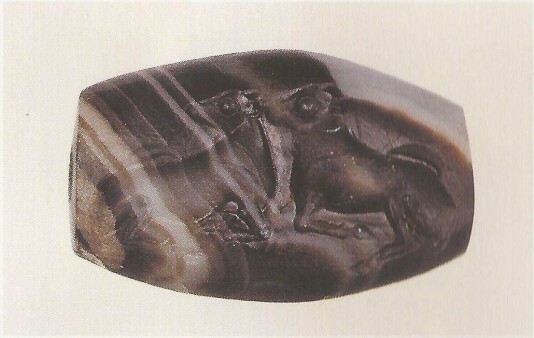 Sealstone brought to light during the excavations of the three buildings on the extensive terrace of the southwest slope of the Lower Acropolis. Near the West Gate, against the inner face of the fortification wall, a large building complex of 14 rooms was found, comprising storage rooms and workshops. The late 13th century BC earthquake destroyed the complex, in which were found piles of clay, stone and metal vessels, clay figurines, jewellery, sealstones, pieces of semi-precious stones, tools and fragments of wall paintings. Of special significance are a large wheel-made statuette of a goddess, a stone mould for making jewellery, a storage stirrup-jar inscribed in the Linear-B script and a clay sealing with an ideogram in the same script. Another complex of rooms was discovered inside the East Gate, which had also served as workshops and storage rooms before their destruction at the end of the 13th century BC. Clay vessel found in the remains of the building complex.